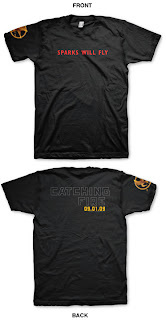 The Compulsive Reader: Contest: Win Catching Fire and Swag! I know we're all very excited about the release of Catching Fire, the sequel to The Hunger Games, and now to make the release even sweeter, I'm hosting a contest, giving you a chance to win a copy of the book and some neat swag! Want to know more about The Hunger Games? All right, so to enter to win, all you have to do is leave me a comment below! Simple as that. I'm going to let this contest run until the end of the month, September 30th, and will notify winners on or around October 1st! The Catching Fire book promotion is open to participants with a United States mailing address only (international readers can enter if you have a friend in the States who can accept your prizes by mail!). Entrants under age 13 must have parent or guardian permission to enter. Oh, and if you want some more Catching Fire fun, be sure to check out my blog post about the day I met Suzanne, the video I participated in with Suzanne, and my review! All set? Let the games begin! Limited Edition T-Shirt? Count me in! I'd die if I won this one. Thanks so much for the awesome contest! This book is going to be the hit of the year with my students! The t-shrit is so cool! Ooh I would love to win this one. :) I'm so happy you're as excited about Suzanne Collins as I am. I would love a chance to win this! Would be the greatest gift for me to get it!! Thanks for putting up this contest!! Yay! Thanks for hosting this contest! Please enter me! 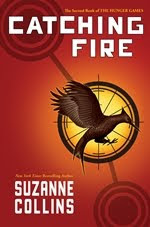 I'm newly obsessed with this series (actually just wrote a post about it called Confessions of a Hunger Games skeptic.) and would love to win! Thanks for the offer! What a great giveaway!! Please include me too. Today is my birthday, so I am feeling really lucky! Thanks for the opportunity of prizes!! AHH that tee is soo cool! Can't wait to read the book. Count me in for this!!! An awesome book AND a limited-edition T-Shirt? Count me in baby! Please enter me :) The shirts are about the coolest thing ever! I'd love to enter the contest as well! Thanks for the great contest, I love your blog. I love T-shirts almost as much as I love YA lit. Ahh, I just got this from the library (I hate having no money for books :( ) and I can't wait to read it!!! T-shirt? count me in! I'm interested! The swag it's self sounds awesome! I so can't wait to read this! I would love a Tshirt! Oh my god! I love the hunger games! My friend would stab me if I won this...I want to win! I loved the first book and it would be amazing if I won this contest (I really want a mockingjay pin)! Thanks for this contest and good luck to everyone who's entering! The t-shirt and pin sound fantastic! Plus the book!! Thanks for hosting a great contest. I want the shirt so much. O_o! limited edition t-shirt, pin AND my favorite book of the year?!? O_o indeed! Awesome contest! Please enter me. o_O Thanks! This is so cool! Loved THG. I cannot wait for the next book to come out, but we have a whole year! Also super excited about the movie! Cool contest. Count me in. Oh I can't wait to read Catching Fire! I've read so many great reviews of it, and it seems even better than the Hunger Games! I had to give my dad my copy of Catching Fire because Hunger Games was the 1st YA book he has read ever and he asked for the 2nd book after reading the 1st in a day. Such a good book. . .an an awesome contest! The Hunger Games was the best book I ever read until Catching Fire. Susanne Collins has outdone herself! I teach high school and wish these books were on our reading list. They are fabulous! I would love to wear a shirt to school! I really want that shirt! I would love this tshirt! Wow! This is amazing! The Hunger Games is one of my absolute favorite books ever!!!! Please enter me! So many cool things to win from this contest...enter me please! The book was amazing! I hope I win! Please enter me, I read the hunger games and LOVED IT!! That shirt looks soo cool too! Thanks! Hey this is Megan! I read the Hunger Games when I found it on Amazon.com. I would never take this shirt off if I won it lol. I am quickly becoming obsessed with this world, and I NEED a mockingjay pin in my life! This is a great contest! So excited to read the book. Thanks for the chance to win! Please please enter me!!!! Thank you. Wow, excellent blog and congratulations on meeting Suzanne. That's incredible. We have a lot of Hunger Games fans here in Brunei now too! We'll look forward to the movie. omg that shirt looks so cool! please enter me! That T-shirt is awesome. Too bad they're not selling them, they could make a lot of money off it. I liked your review too, very nice. Anyway, count me in for the contest! Yay! I would love to win a copy! aww man. i rly rly rly want a shirt lol. the book was amazing!!! i could use a copy of it, though, because i want to reread it and my friend just finished the Hunger Games. Is there somewhere i can BUY the shirt??? i would get one in a second. Please enter me in your incredible giveaway.